Fast Nine qualifying for the Indy 500 takes place today from 5:00-5:45 p.m. The fastest drivers from yesterday’s qualification session will run again at this time to determine the order of the first three rows of the grid. Castroneves was the fastest driver on the track yesterday with a four lap average of 228.919 mph. Carpenter was close behind with an average of 228.692 and Pagenaud was third with a 228.304. All of these times will get wiped today and the top nine will have 45 minutes to determine the starting order. Using every driver’s best four lap average from yesterday, I constructed confidence intervals for each driver to get an idea of what they are capable of doing on pole day. If you aren’t familiar, a confidence interval is a range of values (in our case, speeds) that the statistic we are looking at (four lap average speed) may take, along with a known degree of uncertainty. So our confidence intervals will give a range of speeds that we can expect from each driver on Sunday. 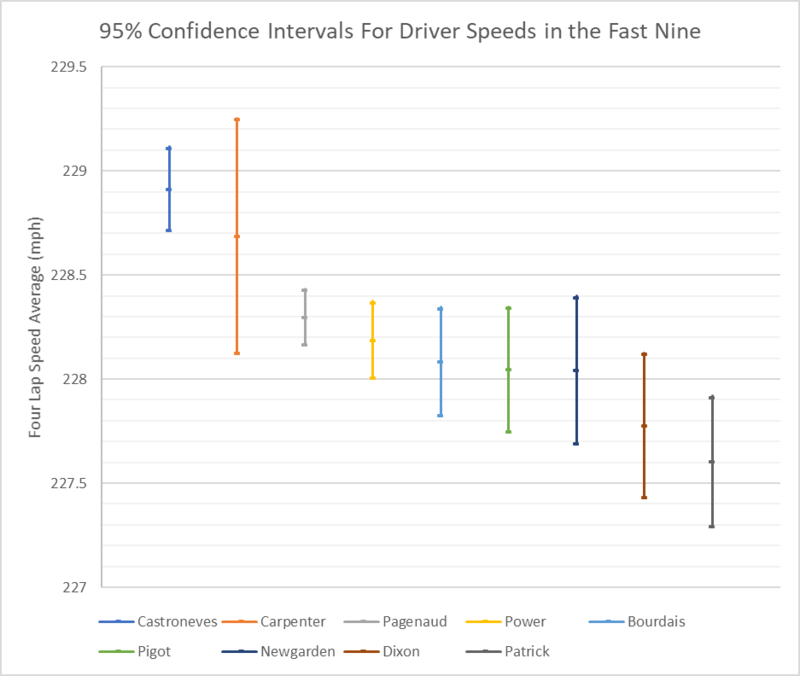 Since I created a 95% confidence interval, if we were to have these drivers run sets of four laps over and over and compute the average speed of each of their four lap sets, we would expect 95% of these run’s average speeds to be in our confidence interval. So there is a chance that Castroneves’ speed today isn’t in his confidence interval, but it is very likely that it is if the car has a setup comparable to Saturday. Obviously if teams make drastic changes to the car that will change, but since all of these drivers were in the top nine, it’s very likely their cars will be similar to yesterday, making it safe to use a confidence interval. If you have any more questions on confidence intervals, leave a comment below or reach out to me on Twitter @thesingleseater, I’ll be happy to reply! From these intervals we can see it’s very likely pole position will come down to Castroneves and Carpenter if other teams don’t find major speed on Sunday. The only driver whose confidence interval’s upper bound even reaches the lower bound of Castroneves’ is Carpenter himself. What’s especially interesting about Carpenter’s confidence interval is that it is by far the widest of any driver. While Castroneves and Pagenaud ran four consistent laps, Carpenter varied from the fastest single lap of any driver (229.266 mph) to one of the slower ones of the fast nine (227.913 mph). This explains why his upper bound is higher than Castroneves’ despite having a four lap average that was slower than his yesterday. There is a chance Carpenter’s inconsistency could hurt him today and possibly allow Pagenaud or Power to sneak into the second spot he held yesterday. It’ll be an interesting story line to watch as Carpenter makes his runs. If he can get another lap up there in the high 228s he could be on pole position, but if stutters and his inconsistency flairs up again today he could drop off of the front row. The safest bet for pole position will be Castroneves with his consistent four laps and outright fastest speed from yesterday. Newgarden also showed strong signs yesterday but without a lap in the high 228s, I don’t see him making it in the top five spots on the grid. I’ll be comparing these confidence intervals to the speeds we see today after qualifying so be on the lookout for that!